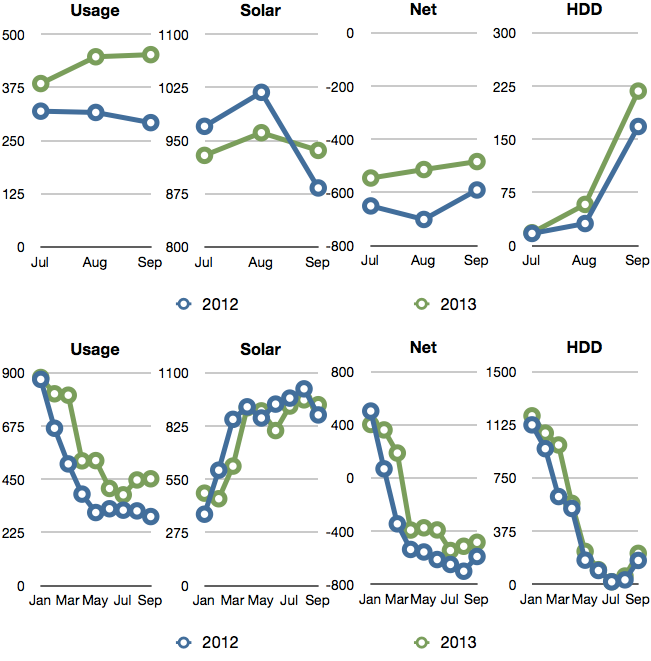 Q3 2013 summary: 36% cooler, 38% more usage and 2% less sun as compared to Q3 2012. In Q3 last year our total usage was 927 kWh. 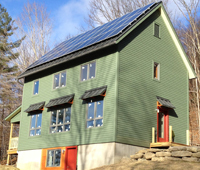 This year is was 1,283 kWh, a 38% increase. Although it feels like it had rained a lot more this year then last, we only produced 2% less energy in Q3. Overall, here’s how this quarter and the first three quarters compare to 2012. We used 38% more energy (356 kWh) this quarter as compared to 2012. That’s about 3.9 kWh extra per day, or 161 watt hours per day more than last year. The last two quarters we’re been running about 5 kWh higher. Last quarter I predicted this quarter usage would be up roughly 230 kWh from Q3 2012. It was actually up 356 kWh. I didn’t take into account the fact that we would be buying a plug-in hybrid car. However, we used a lot less cooling this quarter. We used the ASHP for roughly 5 hours in September for a total of 3.7 kWh, a 93% reduction. Third quarter last year the ASHP used 50.6 kWh. We used the air conditioner a lot last year mainly for dehumidification because the house was still drying out and we didn’t want any buckled floors. The house seemed to cope well with the humidity this year. That means we used roughly 403 kWh more than last year if you factor out cooling. That’s about 4.4 kWh per day. I’m using about 432 Wh per day for the home office. If the Prius is using about 3.8 kWh per day as predicted, that means there’s another 200 or so watt hours unaccounted in there per day in comparison to last year. Our water usage is down 13%, and our hot water usage is down 12% from Q3 2012. More rain equals less watering the garden. Less barn building this summer equals less showers. Predictions for next quarter? Will we use 4 or 5 kWh more per day than least year? Stay tuned!